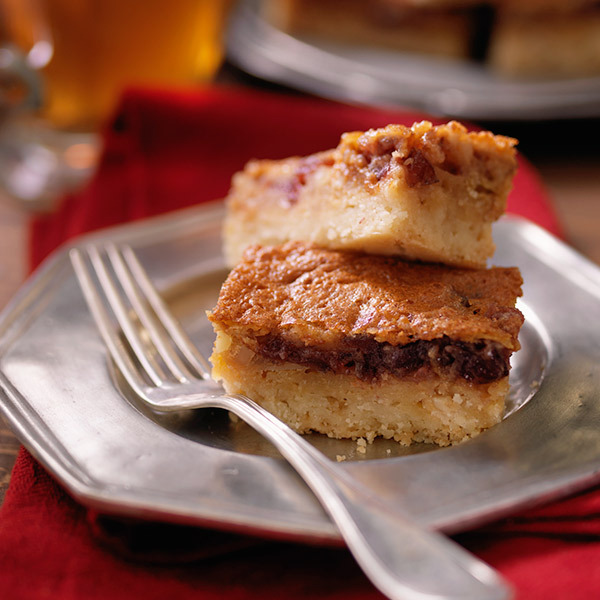 Give your leftover Thanksgiving cranberry sauce a tasty makeover with this Cranberry Bar recipe. It doesn’t matter what type of cranberry sauce (whole berry or jellied) you use for this recipe, but a traditional Thanksgiving cooked sauce works great. It is mixed almonds, eggs, brown sugar and other ingredients and added to a shortbread crust to create a memorable dessert. Preheat the oven to 350°F. Grease the sides of an 8-inch square baking pan. Make the crust: In a food processor, combine the flour and granulated sugar. Add the butter, and pulse until evenly combined. Press the mixture into the baking pan, and bake for 35 minutes or until golden. Remove from the oven to add the topping, but leave the oven on. Meanwhile, make the topping: In a bowl, with an electric mixer, beat the eggs and brown sugar until light and fluffy. Beat in the flour, baking powder, salt and vanilla. Stir in the cranberry sauce and almonds. Pour the topping over the cooked shortbread bottom, and return it to the oven for 40 to 45 minutes, until set and evenly browned on top.